What is now Class 3b started as a beginners class with spur mounted engines but quickly developed into a very expensive and trick option. This car is one of hundreds built by Edvard Stelling in Lithuania with the intriguing feature of the tuned pipe cast into the chassis pan. 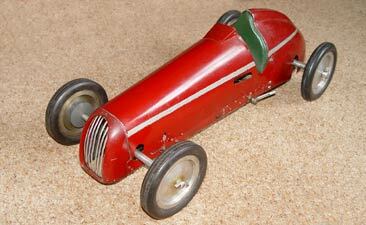 Most ended up re-engined and with conventional pipes fitted, so this is a real survivor. Currently for sale on eBay. 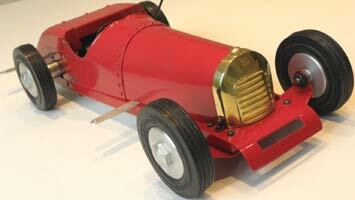 The body of this lovely little car is original Oliver, more normally fitted with a twinshaft motor. 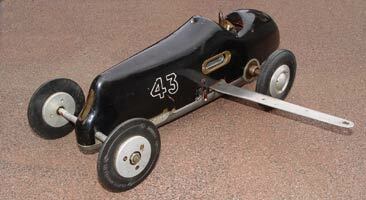 This one has a standard single ended Elfin aero motor, on a block that picks up on both mounting lugs. 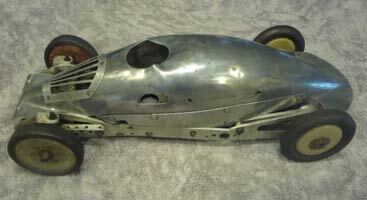 The outer wheel is attached to the Elfin crankcase via a machined housing, but whether it is a slave or driven is not known. 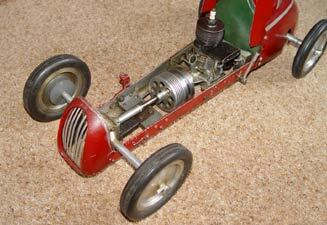 The Elfin motor was equal to the Oliver in its time as Gerry Buck proved. 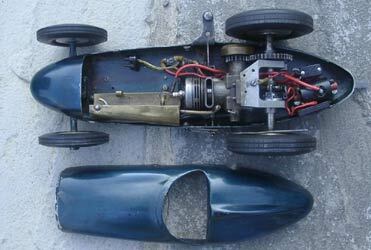 These are not strictly Oliver cars as it was one of a range of semi scale cars originally designed by Harry Howlett who was responsible for most of the casting for the Oliver concern. 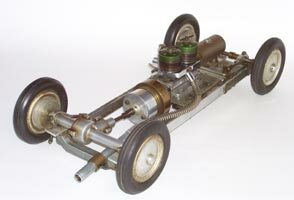 The Alfa initially had a single-ended motor on a spur mount, but eventually it would be the twinshaft that powered the entire Oliver range. Olivers added the Tiger 2.5 and the Bomb to the range of cars they sold, but Harry Howlett was always acknowledged as the designer of the scale ones. 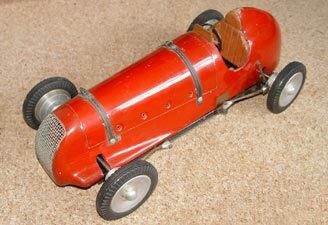 All that was known about this car, sold on ebay as just a chassis and body, was that it was from the estate of the late Bob Curwen, one of the pioneers of tethered car racing in the UK. Only when the Westbury archive was obtained did it become clear that this was the car that followed on from the Curwen Special and was probably the last car that he raced. The twin port engine was unusual in being able to be run as a diesel or glow-plug and saw service in Bob's 'Elf' hydroplane as well. This Challenger bodies version has a chassis number of 1188, which puts it in the first year or so of production. Currently there is no engine fitted and no sign that there ever was, which is the state most of the front engined M&Es seem to be in as there does not appear to be enough room for any of the 6-10cc engines around at the time. The mounting system shown in the catalogue will definitely not work on the Challenger or Austin, but does with an Owatt in the larger ERA body. Strangely chassis numbers 1188,89,90 have all turned up. As far as is known, this is the only complete and original Austin bodied version of the M&E to exist. The only other one had the axles cut off to fit ZN wheels, but it is hoped to replace these with originals in the not too distant future. This car came without a motor or mounts but now a period K Vulture nestles in the correct place. The chassis number of 1458 dates it to 1948 and like the other survivor showed no evidence of ever having been run. There was at least one more sold, but whether that still exists is unknown. We had seen details of this car somewhere, but has taken months to pin down the article that featured it. We believe that the car was built by a Mr Lindupp of the Handley Page MES. It was certainly on show at the opening of the Society's new track in Nov 1947 although not running at that time. The car appears to have front steering and suspension and based on the designs of D B Wright, and was originally fitted with friction drive and a Kestrel motor. This is definitely a first, a Taplin Twin installed in a 1066 MRC chassis. Given that the Taplin did not come onto the market until 1959, this is obviously a later marriage. Unusual detail is the 1066 C1 clutch rather than the more common, three-shoe, centrifugal version. 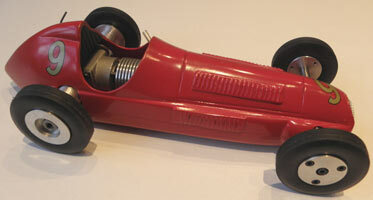 The car has also been built with the gearbox turned over making the front of the car now the back. Most of the car is original 1066 although some of the suspension components are definitely home brewed. The straight rear radius arms indicate this was one of the later kits. This car produced, by Paul Zere's ZN concern, represents the transition in the British tethered car market as it was one of the last commercial models to be produced and intended purely for racing. When announced in 1951 it cost a not inconsiderable £22-10-0 but this was ready to run and 'tested'. All that was needed was the small matter of a Dooling McCoy or ETA 29 to bolt in. In 1953 at the Edmonton track, a ZN car identical to this in the hands of Tom Prest was the first British 5cc to exceed 100mph. Examples of this car are exceedingly rare and unfortunately, the one shown here has now vanished. A lovely and early example of probably the most numerous and successful of all tethered cars, the Dooling Arrow. This one has had the attention of a hacksaw on the lugs to allow a pan handle to be fitted at some time in its career as did many others. 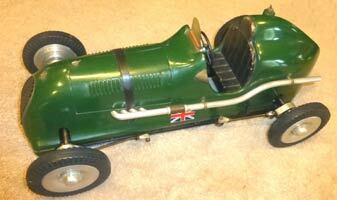 The car is a real garage find as it is in the condition it was last raced, believed to be by a member of the Derby Club. Just need to find who ran as number 43?